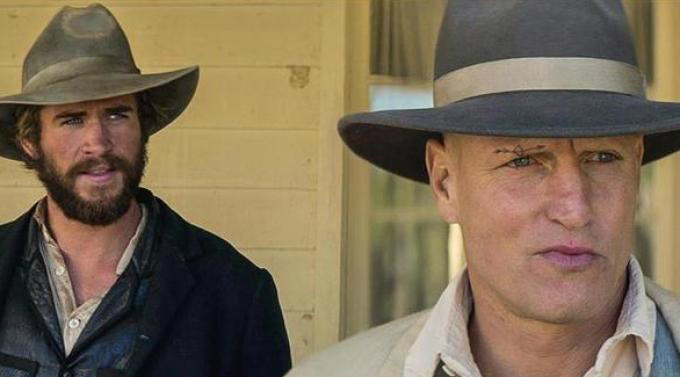 Woody Harrelson and Liam Hemsworth saddle up in today’s first trailer for The Duel, an all-new Western primed to ride into theaters in little under two months’ time. And so, to herald the arrival of Kieran Darcy-Smith’s (Wish You Were Here) genre piece, Entertainment Weekly has premiered the first trailer and poster, introducing Liam Hemsworth’s Texas Ranger as a man on the case. While investigating a string of unspeakable murders in a local town, Hemsworth’s grizzled lead crosses paths with “a charismatic preacher (Harrelson) who raises more questions and answers with his mysterious ways. Here’s the film’s all-too-brief synopsis. Darcy-Smith’s run-of-the-mill actioner is arriving during a mini renaissance for the Western genre, with the likes of Bone Tomahawk, Quentin Tarantino’s star-studded The Hateful Eight and the long-in-development Jane Got A Gun releasing in theaters over the past few months. It’s a trend that will continue long into the summer, too, what with Antoine Fuqua’s The Magnificent Seven remake glistening on the horizon. Look for The Duel to gallop into select theaters and on demand services on June 24. Alice Braga and Emory Cohen also star.